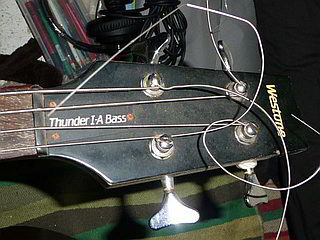 The in/out/turny knob on my Westone Thunder IA Bass (1980s SN 6050231) spun in its location and a wire became detached. I think the wire belongs on that switch rather than having been wrenched from somewhere else. 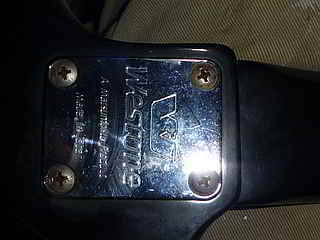 The wire is the black internal of the 4-core coming from the pickup. The other 3 cores are red, brown and orange and they attach to the in/out bit of the switch above the pot as per photo. 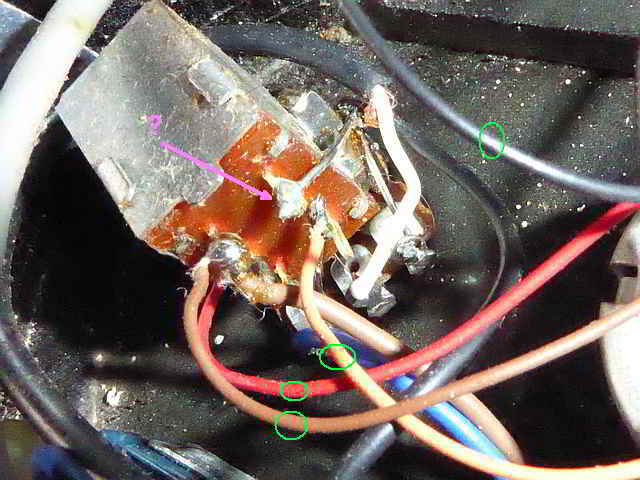 It is usually easy to tell which bit it detached from by witness marks but in this case it's hard to tell if it's come from the grounding terminal as there's other stuff soldered there [pink arrow]. 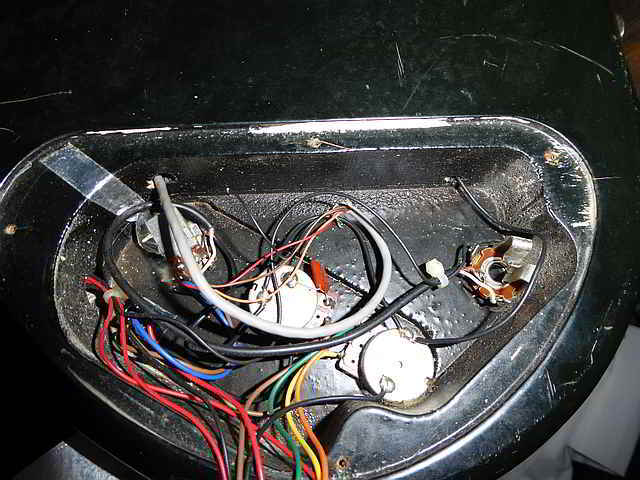 There are empty switch tangs but no solder evidence on those. I've looked online but this is single pickup (dual coil) and the 4-core colouring does not seem to match the diagrams I found so may be mine's a UK version?? It has active circuitry (2 batteries worth of it!!) so I don't want to go joining the wrong bits. Does any one happen to know the wiring on these? Thank you Barry for that link. That's one of the ones i found earlier with the 2 pickups and the colours are different. Is their dual tone the same as the bit on the back of my pull/push rotary knob? I suppose if I stop and think about it the three cores from my pickup land on non-ground terminals so I guess by a process of elimination the 4th must be ground. I guess it doesn't matter which bit of the ground linking it solders to. Am I barking up the right tree? The pink highlight is the push/pull/turn knob with the plastic wheel missing. The left most knob in this picture is the one with the centre detent. It's a while since this one was last used and I can't exactly remember which knob does what. Thanks for helping me to think it through. Don't know enough about these beasts. Damian, anything? 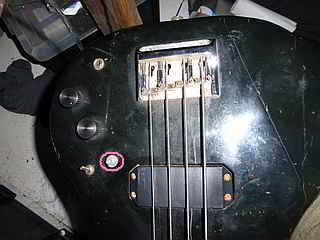 I'm not too sure either; on my passive Spectrum LX Bass, the bottom tone pot push/pull is phase reverse, and that's the only push/pull it has. I'm pretty sure the controls on yours will be volume, tone and pre-amp volume, top to bottom. Is the mini switch the pre-amp on/off? Connect the loose black to your pink arrowed terminal. Controls are volume pull/push series/parallel, passive tone, active tone. Mini switch active on/off. I'm not even sure that the active bit was working/had batteries last time it played. Unless I was being careful and took them out before storage. [I'm mostly a guitarist/vocalist but want to use it for composing bass tracks. 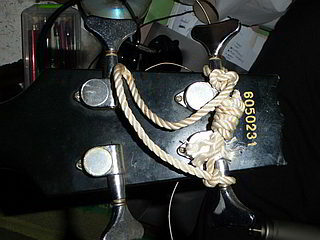 Sometimes I just lift it off the wall and twiddle an idea without an amp or do it on the acoustic but need to be sure the reach is achievable. Now I want to track it into Cubase via the USB box]. Thanks for confirming the black to ground. Does anybody know what exact model variation I have here if it differs from the official circuit diagram? Just in case I need circuit spec for spares in the future. Version III 85/86. Last one's from Matsumoku. Went to Korea after that. Have a look on the website under Thunder Bass. There's a red one like yours. Cheers for your very kind help. Soldered up and playing now. I just need to extend the callouses down from my fingertips! Done one quick song though.